You probably know that having a crop rotation is a good thing. Growing different crops back to back provides several benefits, such as preventing pests and disease, improving soil health and reducing fertilizer inputs, all of which can boost your crop yields and your bottom line. By adding cover crops to the mix, you’re diversifying your rotation even more. But have you thought about rotating your cover crops? Should you be using the same cover crop species back to back, year after year? Dave Robison, who runs the blog PlantCoverCrops.com and is an agronomist for Legacy Seeds, says there is value in rotating — especially if you’re using brassicas and peas. Robison warns that if you continually utilize brassicas in your cover crop mix, you need to consider doing some level of rotation. The reason for this is that growing brassicas back to back — mainly turnips, but also radishes — can result in clubroot. Clubroot is a disease that attacks a brassica’s roots. While this can result in an unhealthy cover crop, for farmers who grow brassicas as a cash crop — especially canola — the disease can be detrimental. According to the Canola Council of Canada, clubroot causes premature death in canola and is considered a serious disease due to the spores ability to survive in the soil for up to 20 years. Robison saw first hand how this disease can impact crop growth when he did some work with Ed Ballard, now retired University of Illinois Extension Animal Systems Educator. Clubroot in turnips. Photo by Maureen Austin, Ohio State University, Department of Plant Pathology. Their work was focused on extending the grazing season by planting oats, rye and turnips after a cereal grain. While the first few years were excellent , eventually they began noticing the turnip yield diminish and realized clubroot was the culprit. “We need to be cautious to do some level of rotation, so that maybe not every single year includes a brassica,” Robison says. He recommends only seeding a brassica every other year. 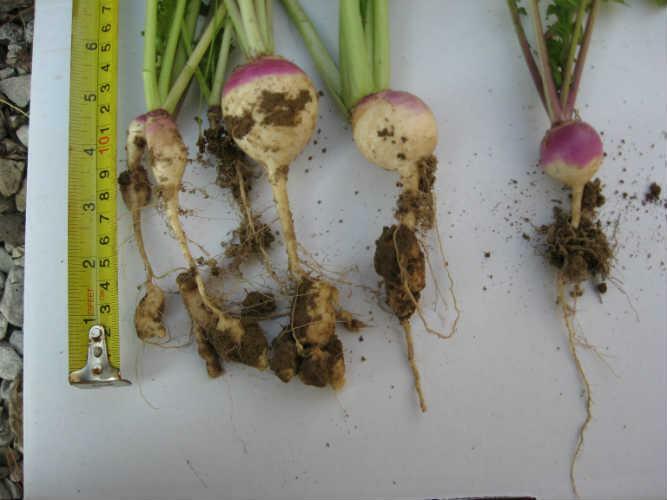 Michigan State University Extension advises not planting oilseed radish as a cover crop on the same field for more than two years in a row, and avoiding it when growing cabbage, broccoli or radish for cash crops because of its susceptibility to the disease. Robison acknowledges that growing a brassica back to back does not automatically result in clubroot, especially if a grower’s only seeding a couple pounds per acre. Peas are another cover crop farmers should avoid growing too often in rotation, Robison says. “Peas have been known to have some detrimental effect in the soil, if they are used back to back to back,” he explains. While peas are usually followed with corn to utilize nitrogen in the soil and break the cycle, Robison says a dairy operation may end up using peas in an oat or triticale mixture back to back for more feed. Even with cereals mixed in, it’s not a wise decision. Like brassicas, Robison recommends only using peas as a cover crop every other year. If you’ve been saving and replanting seed from your cereal cover crops and you’re seeing diseases in your cover, it’s not the rotation — it’s the seed. Robison saw this first hand recently with some farmers who had been saving the seed from their cereal rye cover crops and replanting them for four or five years. “The challenge is if we do not have a healthy cereal grain crop that we’re harvesting — let’s say we see a lot of ergot or rust or we have other issues in our cereal grain — and then we harvest that, we end up replanting that disease back into the field again. “That ends up costing us production on our cover crop because we’re planting a disease seed. I know it’s ‘just a cover crop,’ but the reality is you’re adding a disease back into your field,” which could become an issue for following corn crops. Ergot on rye. Photo by George Wong, University of Hawaiʻi at Mānoa, Department of Botany. It’s also worth keeping in mind that there may be legal implications to saving and replanting cover crop seed, and farmers should ensure they’re abiding by the law. Robison recommends growers avoid these issues by buying clean, tagged, high-quality seed. While it’s important to consider your cover crop rotation, Robison also wants farmers to think about how those covers fit in your overall rotation — and not just in regards to the next cash crop. “We’ve got to be aware of what we’re planting in that field not just next year, but also the year after,” he says. This can be an issue for cereal grain farmers using annual ryegrass as a cover crop, where having a few escapes is not unheard of. 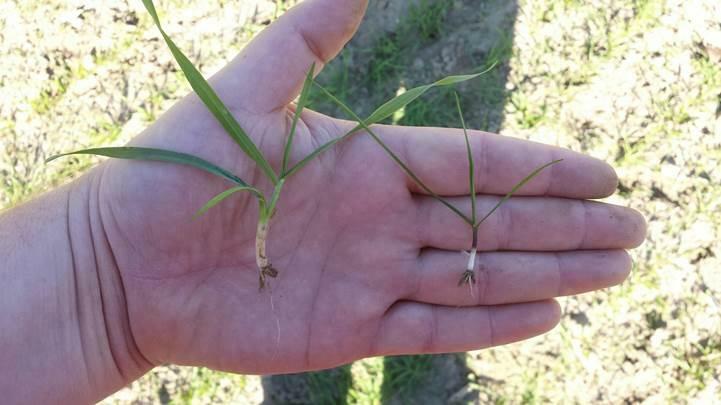 Photo from University of Georgia Ag Extension shows both wheat and ryegrass seedlings emerging in the same field. The ryegrass was found around edges and obstructions in the field. At the best this can result in a dock up to making the crop completely unmarketable, depending on how much of the ryegrass is in the wheat. To avoid these kinds of issues in both your cover and cash crops, Robison recommends creating a 5-year cropping plan, and choosing your cover crops based on what cash crops you’re growing and when. “Farmers can then make good choices, or the best choices, of what they’re going to utilize over that time period,” he says. By making these cropping decisions early, you can look out for any kind of risk that may occur down the road. “If there’s an escape, will it fit the next crop as well?” Robison asks. Despite the risks that can occur, the last thing Robison wants is for farmers to be afraid of using cover crops completely.